NIA-CHARLESTOWN NEVIS (February 07, 2011) — A call was issued for persons on Nevis to exercise greater vigilance in an effort to guard against pradial larceny. The lawless act has over the years continued to be a headache for farmers, fishers and agricultural officials on Nevis and according to Permanent Secretary in the Ministry of Agriculture on Nevis Dr. Kelvin Daly it was a crime of opportunity. He also called on the Federal Authorities to strengthen the existing legislation which he said was weak. “We are hoping that the Federal Parliament would take up this problem and put the necessary changes in the existing laws which are quite weak, to strengthen them, to increase the penalties on them, to have an enforcement arm that looks strictly at pradial larceny. They have such organisations in Trinidad and Barbados. They have branches of the Police Force that look strictly at pradial larceny and we are going to have to start looking in that direction. We are not too small, we are losing just as much proportionally as everybody else. 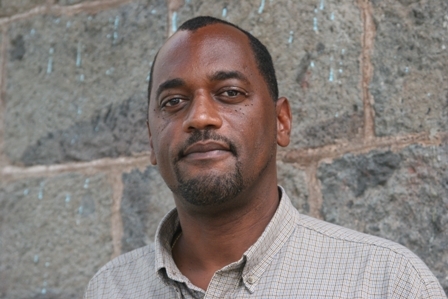 “From the Ministry’s end, we are asking farmers to try to improve on their facilities that are housing animals so that we can lessen those incidents and for the general public to come on board with the farmers and fishers of Nevis, to make it a lot more difficult for the perpetrators to operate because they are crimes of opportunity. If you put the measures in place, we are certain that you could slow it down a bit … It is a very, very serious matter and we are hoping to target all stake holders in the community to bring an end to this crime,” he said. According to Dr. Daly, Nevis was facing an increase in severity of pradial larceny to crop and livestock farmers and fishers, the theft of sand especially from Indian Castle and cut stones from historical sites. Notwithstanding, the Agriculture Official stressed that the situation with pradial larceny was not restricted to Nevis but was an occurrence documented throughout member states in the Caribbean Community (CARICOM). Dr. Daly quoted a 2010 report entitled “The Working Document for the 34th Special Meeting of the Council for Trade and Economic Development” which had been released at a meeting held in Grenada in October at which he and Minister of Agriculture Hon. Robelto Hector represented Nevis. “The analysis of the state of pradial larceny in member states of CARICOM, it was stated that pradial larceny has become a major risk to security and sustainability of the gains in primary agriculture activities in member states. “Regional farmers and fishers are losing millions of dollars annually. Conservative estimates indicate that the region is using over US$321million or 19.4 percent of region agriculture Gross Domestic Product (GDP) to pradial larceny. “Pradial larceny is one of the most pervasive and entrenched crimes in business and livelihoods and at least one member state it exceeds all other types of crime,” he said. The Permanent Secretary used the opportunity to further draw attention to recent major losses experienced by the Department of Agriculture which has suffered the same fate as livestock and crop farmers. The most recent was the theft of 12 breeding ewes and 2 prime breeding rams at the government estates. “Farmers had lost their prime stock at Low Ground, Bath, Pond Hill, St. Thomas in St. James and the incidents are just becoming outrageous and we are hoping that persons who are participating in these events would see fit to desist from these activities because it is very harmful. “For example, the breeding animals we lost at Indian Castle these are 12 Black Belly sheep that provide breeding stock for other farmers to use. The value of the animals far exceeds the meat value. The breeding potential is estimated at EC$15,000 and I am certain that these persons who slaughtered those animals could not have gotten more than EC $1,000 for the carcass. I have no doubt that the animals are being killed. It is now let up to consumers not to purchase those animals,” he said. 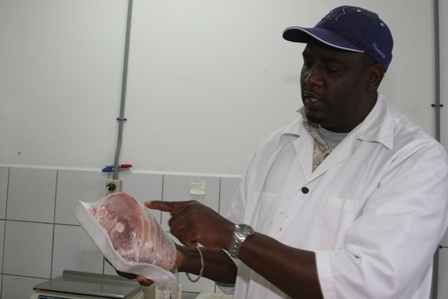 Dr. Daly noted that the Department had repeatedly asked vendors to refrain from purchasing meats that had not been inspected and butchered by the Government’s Abattoir citing that there were several distinguishing marks which would indicate if the animals were slaughtered elsewhere. “We use a band saw so the meat is cut clean. If you see meat cut by a cutlass you can see the difference; the bones are shattered, the meat is pulverised and you know for certain that meat did not pass through the inspection process at the Abattoir. “We have two stages of inspection. We have what you call the anti mortem whereby the environmental health officers would inspect the animals before they are slaughtered and then after they are slaughtered and dressed, they are inspected again to make sure that the meat is indeed suitable for human consumption,” he said. The Agriculture official made clear that restaurant owners and vendors who believe they may be tricked into buying meat, could simply call the Department and ask them to take a look at the meat before any purchase is made to ascertain that it had passed through the Abattoir. In terms of root crops Dr. Daly said thieves have graduated to stealing entire crops and farmers were at their wits end. “Can you imagine farmers taking three and four months to grow a crop and overnight it’s all gone? It’s disheartening, disruptive, it threatens the livelihoods of farmers, it threatens the growth in agriculture that we are hoping to achieve,” he said.